In the Middle Ages, Rosemary was considered a wonder plant, which could be used to treat many illnesses and keep you healthy. One 14th century writer found 23 uses for it, including keeping your hair beautiful and preventing nightmares! This beautiful plant with its blue flowers is native to the Mediterranean region and has a long history dating back to mythological stories. The Greek goddess Aphrodite was said to be wrapped in rosemary when she first emerged from the sea, while the name comes a story that the Virgin Mary had once spread a blue cloak over a white-blossomed bush, which turned its flowers blue. Writers dating back to ancient times praised the plant for its medical uses, and medieval brides would wear a rosemary wreath. A list of its uses can be found in the Zibaldone da Canal, an early fourteenth-century book by a Venetian merchant. 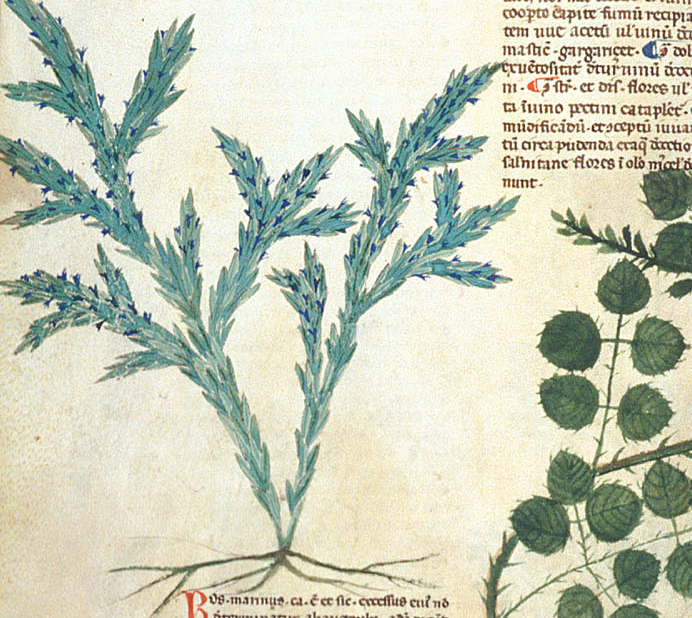 Although he says that there 25 uses for rosemary, the text only includes 23, but they offer a fascinating look at what medieval people believed were the beneficial aspects of plant. These are the virtues of rosemary, which is very good for all illnesses; rosemary has 25 powers, and all are good. 1. The first, take the flower of the rosemary and bind it in a linen cloth, and boil it in water until only half as much water remains, and use it against all illnesses within the body, and drink this water. 2. Likewise, boil the leaf of the rosemary in good unadulterated white win, and wash your face in it, and it will make your face white and beautiful, and the hair beautiful. 3. Likewise, take the flower of the rosemary and make a powder of it and bind on your arm, and it will be quick. 4. Likewise, take the flower of the rosemary and make a paste of it and moisten a green cloth, and brush your teeth, and it will kill worms, and protect you from all ills. 5. Likewise, take the root of the rosemary and put it on hot coals, and breathe the smoke through your nose, and it will cause all rheum to go away. 6. Likewise, take the root of the rosemary and boil it in strong vinegar and wash your feet in it, and it will make them firm and strong. 7. Likewise, take the flower of the rosemary in the morning and eat it with honey and rye bread, and no blisters will rise on you. 8. Likewise, take the leaves of the rosemary and put it in your bed, and you will not have nightmares. 9. Likewise, take the rosemary and make a vapor from it, and it will prolong your youth and strengthen your limbs. 10. Likewise, take the leaf of the rosemary and grind it up and put it on a crab, and it will cause it to die immediately. 11. Likewise, take rosemary and its leaves and grind them up and make 6 spoonfuls of sauce, and eat it with whatever you please, and it will make it good and wholesome. 12. Likewise, take rosemary and keep it in your house, and you will have nothing to fear from serpents or scorpions. 13. Likewise, take a leaf of rosemary and put it in wine, and it will give it a good, firm bouquet and a good flavor, and it will be clean and clear. 14. Likewise, take the wood of the rosemary, and put it into a barrel, or cask, and drink the wine from it. It is good for every illness, and will drive away boils of the breast. 15. Likewise, take the leaf of the rosemary, and boil it, and wash your head, and great weakness from rage, or other causes, will fall away from you, and you will be well. 16. Likewise, take rosemary and plant it in the earth at the head of your vineyard, and it will be better than before. 17. Likewise, take the leaf of the rosemary, and boil it with holy water and dilute some white wine with this water, and make a sop, and it will restore you appetite for eating. 18. Likewise, take the leaf of the rosemary and boil it in strong vinegar and, while it is still hot, put it on your body and know that it will draw diarrhoea from your body. 19. Likewise, take the leaf of the rosemary and boil it in water and when it has cooled to lukewarm, wash your feet with it and then take a cloth and wrap your legs, and all inflammation of gout and other maladies will go from you, and it will heal. 20. Likewise, take great quantities of rosemary leaves and boil them in water, and bathe the man who has become made from illness, and he will be restored to sanity. 21. Likewise, take rosemary and make a fire of it and direct smoke into a hole where you know there is a snake, and it will quickly come out. 22. Likewise, take the leaf of the rosemary and boil it, and when it cools drink it. It will quickly chase away all thirst and you will be restored. 23. Likewise, take the flower of the rosemary and put it your trunk where you keep your cloth, or your books, and you will not need fear the worms that can destroy them.